Factory Records' in-house producer and legendary sonic visionary. Punk induced the birth of three significant labels in Manchester: New Hormones, Rabid, and latterly Factory. HANNETT had already tangled with Factory founder TONY WILSON a SLAUGHTTER AND THE DOGS gig at Wythenshawe Forum, and knew JOY DIVISION manager ROB GRETTON as a Rabid associate. The rising producer first worked with Joy Division on two tracks contributed by the band to the Factory Sample EP, recorded at Cargo in October 1978, then mixed at Strawberry, and released as a double 7" (FAC 2 early the following year. 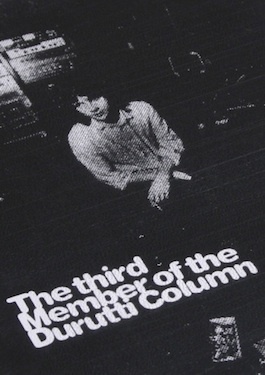 Hannett also co-produced the tracks by a formative version of THE DURUTTI COLUMN, although not those donated by comedian JOHN DOWIE, or Sheffield avant-gardists CABARET VOLTAIRE. Digital and Glass, the JOY DIVISION, represented a huge leap forward for group and producer alike - restraining, isolating and separating the sound of the band, elevating the raw post-punk power they produced onstage towards pure sonic architecture. Just two weeks earlier, Hannett had taken delivery of one of the very first AMS digital delay units, significantly shaping the new sound showcased on their Fac 2 tracks, as well as encouraging the band to embrace the synthesizer. Other favoured tricks in Zero's sonic arsenal included reverb, phasing, compression, repeat echoes, deliberate overload, and the Marshall time modulator - anything, indeed, that created space, weirdness and "sonic holograms".